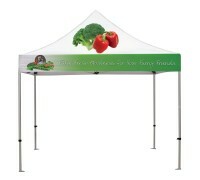 Canopy Tents are a great type of display for outdoor trade shows, exhibits, concerts, festivals, farmer's markets, or any outdoor venue or marketing event and are available in various shapes and sizes to accommodate different needs. 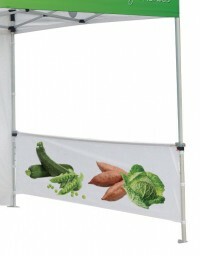 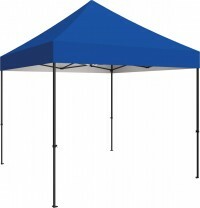 The main purpose of these pop up tent displays is to identify your space, while providing shade for you and your customers. 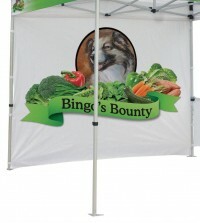 By adding imprinted text and logos, or choosing a custom printed canopy top or walls, they also become an excellent way to get noticed at an outdoor trade show and promote your brand or products. 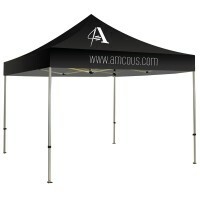 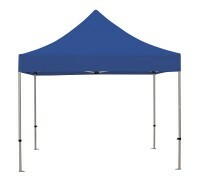 Some tents are available in solid colors or customer printed, while others are only available with custom printing. Most canopy tents have a lightweight aluminum frame that is easy to set up in just a few minutes, but there is also an inflatable model that has no metal frame.